This page is the third story in "The Fall of the Church" series. If you have not read the introduction there, you may want to, then come back here. Athanasius was the bishop of Alexandria, and he was the strongest proponent of the decisions of the Council of Nicea in the eastern churches. 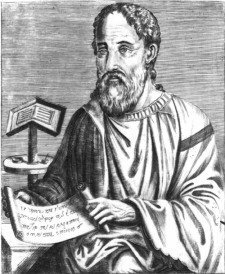 Emperor Constantius, who supported Arius' teaching that Jesus was created rather than born, was constantly trying to remove or execute Athanasius. In fact, he succeeded four times in forcing Athanasius to flee Alexandria. After one of those escapes from Constantius, Athanasius was to be replaced by a bishop named George who opposed the Nicene Creed. Constantius had brought him from Laodicea. The people were not happy about this. Nonetheless, the governor succeeded in gaining control of the church buildings, wrestling them away from supporters of Athanasius who wanted to hold on to them. The context here is that Sozomen has just finished describing several miraculous escapes Athanasius had made from those who were trying to arrest him. Most of these involved the sort of prophetic knowledge of the sort that we find ascribed in Scripture only to Elisha. Such stories are probably exaggerated or invented, as he was writing nearly a hundred years after the events. It's not that I don't believe such prophetic knowledge can occur, it's just that 5th century testimonies of such events are notoriously unreliable. Thus, when George arrived, he was shortly in control of the church buildings, the Christians who opposed the Nicene Creed, and the indifferent ones who would gladly attend the services of any bishop. Sozomen, the writer whose history I am retelling, was most definitely not an impartial observer. I suppose there is a possibility that every bishop that opposed the Nicene Creed was rather wicked, but I suspect a hundred years had given Sozomen and others time to hold all the Arian (supporters of Arius) in scorn. History, as we all know, is not kind to the losers. We do have to consider, however, that many years later, even the pagan emperor Julian the Apostate would find George a dissatisfactory leader. As we soon shall see, George is lucky to have been around for the ascent of Julian to the Roman throne (zzz-ref). Either way, Sozomen tells us that George "ruled by force rather than by priestly moderation." It is likely that he really did persecute the supporters of Nicea. Sozomen adds that he "imprisoned and maimed" many men and women. Everyone considered him a tyrant. He was soon hated by everyone. In fact he was so hated that the supporters of Athanasius "rushed into the church, wanting to tear him to pieces. He barely escaped, and he was forced to flee the city, finding refuge with the emperor's troops. The supporters of Athanasius were now in possession of the churches again, but it didn't last long. The commander of the imperial troops in Egypt showed up personally to eject the supporters of Nicea. He reinstated George, and he put the churches in the custody of George's party. You can probably tell at this point that there was a Nicene party and an ante-Nicene part in Alexandria, sort of like the Republicans and Democrats in the USA. This was true of most cities in the empire, and the split between the two parties caused most of the violence in the churches of the fourth century, though not all of it. Afterward, an "imperial shorthand writer of the notary class" was sent to punish those who led the crowds in their attempt on George's life. Sozomen says that this bureaucrat "tortured and scourged many citizens." There's no nice ending for this short story. George's position as bishop was secure for about five years. The supporters of Nicea had been sufficiently terrorized to leave him alone. Despite the loathing of the people and the negative opinions of the monks of Egypt, George continued as bishop for about 5 years. Finally, in 361, Julian the Apostate became emperor, and he sought to restore old Roman paganism. In the process, authorities arrested, tortured, and put George to death. It took only a short time for Julian to give up on persecution. Soon he told all banished clergy that they could return to their city, and Alexandria was happy to welcome Athanasius home in 362. At this point, having told the third of four stories I have so far showing the state that the churches of the Roman Empire had fallen, to, I should remind you that the battles over the Council of Nicea happened exclusively in the east with one exception in the 350's. It is also important to point out that the battles over Nicea would never have happened, not even in the east, if not for the instigation of Emperor Constantius, Constantine's son, who was persuaded by Eusebius of Nicomedia to support the cause of Arius and his supporters. In fact, the short time that peace was overthrown among the western churches of the empire was also because of Constantine who went to Italy in 350 to put down an uprising that had overthrown and killed his brother Constans. The stories of the events surrounding the Council of Nicea are told in my Nicea pages. They are much more thoroughly covered, with explanations and much documintation, in my book Decoding Nicea. In the next story, Rome brawls over papal elections. Are you interested in studying Christian history on your own? I've put together a starter package for you, as well as books you need to go further.